The tradition of devotion to St. Jude goes beyond a simple Bible story; in fact, it is a reflection of the ability of ordinary people to call upon their powerful faith to triumph over seemingly impossible odds in their daily lives. Legend has it that St. Jude was born into a Jewish family in Paneas, a town in the Galilee portion of ancient Palestine, the same region that Jesus grew up in. He probably spoke Greek and Aramaic, like many of his contemporaries in that area, and he was a farmer (as many of his family were) by trade. Jude was described by St. Matthew (13:55) as being one of the “brethren” of Jesus (the Hebrew word for “brethren” indicates a blood relationship of some sort). Jude’s mother, Mary, was referred to as a cousin of Jesus’ mother Mary, while his father, Cleophas, was the brother of St. Joseph. Jude had several brothers, including St. James, who was another of the original Apostles. His own first name, “Jude”, means giver of joy, while “Thaddeus”, another name he was called, means generous and kind. He was later married, had at least one child, and there are references to his grandchildren living as late as 95 A.D.
Jude was then called to be one of Jesus 12 Apostles, and began preaching the Good News of Jesus to Jews throughout Galilee, Samaria, and Judea. St. Jude went to Mesopotamia (present-day Iraq) around 37 A.D., and became a leader of the Church of the East that St. Thomas established there. St. Jude was a true internationalist, traveling throughout Mesopotamia, Libya, Turkey, and Persia with St. Simon, preaching and converting many people to Christianity. He was credited with helping the early creation of the Armenian Church, and other places beyond the borders of the Roman Empire. Around the year 60 A.D., St. Jude wrote a Gospel letter to recent Christian converts in Eastern churches who were under persecution. In it, he warned them against the pseudo-teachers of the day who were spreading false ideas about the early Christian faith. He encouraged them to persevere in the face of the harsh, difficult circumstances they were in, just as their forefathers had done before them. He exhorted them to keep their faith and to stay in the love of God as they had been taught. His inspirational support of these early believers led to him becoming the patron saint of desperate cases. 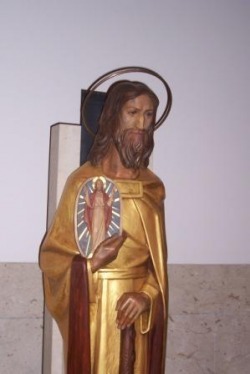 St. Jude is traditionally depicted carrying the image of Jesus in his hand or close to his chest. This idea comes from a apocryphal story in which King Abgar of Edessa (a city located in what is now southeast Turkey) asked Jesus to cure him of leprosy and sent an artist to bring him a drawing of Jesus. Impressed with Abgar’s great faith, Jesus pressed his face into a cloth and gave it to St. Jude to take to Abgar. Upon seeing Jesus’ image, The King was cured and he converted to Christianity along with most of the people under his rule. In the Middle Ages, St. Bernard of Clairvaux (France) was a renowned devotee of St. Jude, as was St. Bridget of Sweden. Devotion to St. Jude began again in earnest in the 1800’s, starting in Italy and Spain, spreading to South America, and finally to the U.S. (originally in the Chicago area) in the 1920’s. 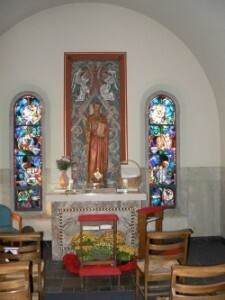 Novena prayers to St. Jude helped people, especially newly-arrived immigrants from Europe, deal with the pressures caused by the Great Depression, Second World War, and the changing workplace and family life. Why has devotion to St. Jude continued to grow to the present day? In spite of (or possibly because of) all the advances human society has made, human beings find themselves under incredible stress and have difficulty coping at one time or another. Increasingly, people are finding that technology and other man-made innovations are unable to provide comfort and hope when it is truly needed, so millions of people around the world turn to St. Jude when they feel the most helpless and alone. St. Jude has proven to be a true friend and a beacon of hope to those who call on him–always willing to help and seek help no matter how desperate the need. And in today’s tumultuous times, we need him more than ever. We celebrate his feast day on October 28. To the left of the Main Altar is a small chapel. Above the doorway, you’ll see in Stained Glass, “St. Jude Chapel”. Please feel free step inside for an opportunity for QUIET, prayer. There is a petition basket for your Petitions to St. Jude. The relic is also available on the altar for veneration.